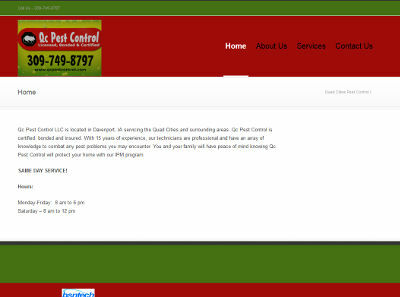 Scott, the owner of Quad Cities (QC) Pest Control, contacted us last week needing some help with creating a website. Scott already had purchased his website hosting and got a WordPress site setup, but he didn’t know how to change the look/feel of the site or enter his information. Upon getting his list of items for his site, we got started right away and had a website running for him in just a few days. Scott then followed up with us asking for a couple of changes, which have been completed. The QC Pest Control website is now complete! It is a simple five-page site with a contact form using the text content that Scott provided us. The QC Pest Control website is at qcpestcontrol.com.